A tired sleepless baby is never fun even more so, when they are teething. Amber teething remedies can calm down you little ones or even help a child with adhd, restlessness and anxiety. This ombre color amber necklace is made from Baltic amber hand gathered on the shore of the Baltic sea. Fastened with safe tension release fastening. Each piece of amber is placed between knots to prevent loosing amber if the necklace breaks. The necklace is 12-13 inches/33cm long. How does amber work to help with teething pain? The body's temperature warms the amber, which releases the healing oils through the skin and into the bloodstream. It stimulates the thyroid gland to help reduce drooling and soothes red inflamed cheeks. 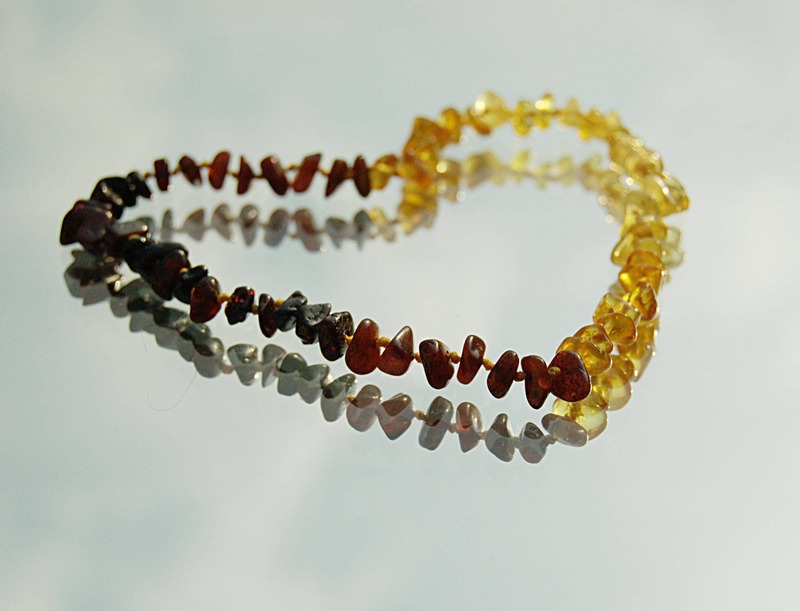 All of the amber used in the necklaces comes from the Baltic sea and is natural, untreated with chemicals. An appropriate length of teething necklaces should be so that children shouldn't be able to fit the necklace in their mouth while it's been worn. I have Honey, Butter-squash, Cognac, Cherry, Mixed, Mixed Cognac and Honey coloured teething necklaces, I hope you find what you are looking for! Very light. Easy to wash and easy to put on. I love it. He doesn’t seem to mind either. Been using it for probably a week now and it’s been awesome. He doesn’t throw tantrums anymore cause of him hurting. Wash amber items with warm water and very mild soap, do not heat the amber and keep away from direct flame. Keep sterling silver items away from moisture and sharp objects. If silver has tarnished -- use soft cloth and some toothpaste to polish the silver, rinse with warm water afterwards and dry carefully.